Movie watching on this Saturday was just killing time in the afternoon waiting to be picked up for dinner and a concert. Its one of those times when you realize you don't have time to what you need to so instead you just sit and watch TV. I put in the Movies! TV Network which is second to TCM in my mind simply because they run commercials. 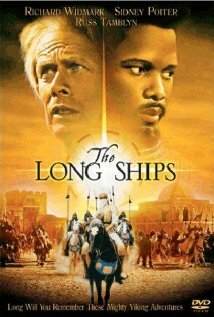 THE LONG SHIPS is a Hollywood historical adventure that is largely a WTF film.Its one of those films where you wonder what they were thinking when they made it. Very loosely based on a popular Swedish novel the film has a group of vikings going on a hunt for a giant bell called the Mother of Voices off the coast of Africa. Also looking for the bell is Sidney Poitier as a Moorish king The collision of cultures proves not to be good or anyone. Poitier supposedly dislikes the film a great deal. Its a feeling I can completely understand since it comes off as a completely crazy story. I'm very curious how the story plays out in the source novel since here you never really believe a minute of it. On the other hand on the pure popcorn, I don't want to think a rational thought scale the film is a great deal of fun with a couple of set pieces- the giant razor blade death machine and the efforts to get the bell off the mountain where it stands being rather exciting. After THE LONG SHIPS they ran MORGAN THE PIRATE one of the numerous Steve Reeves movies where he wasn't Hercules. Actually Reeves only made two Hercules movies and a few more sword and sandals films, the rest other types of film. 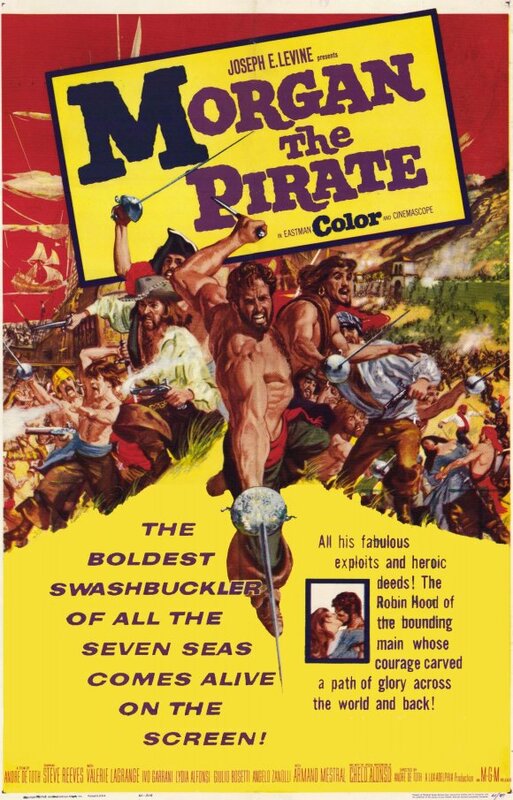 MORGAN THE PIRATE is a film you'll swear you've seen before simply because you've seen a ton of other films that are exactly like it. I've seen at least four other films this year with the same plot (a couple of which I reviewed). Here Morgan is an Englishman who was captured and made a slave by the Spanish in the Americas. Bought by a rich young noble woman he ends up on a galley when his affair with the woman is discovered. He over powers his captures becomes a pirate and ends up capturing his lady love not long before he attacks her home city. If you've seen one variation of the plot you'll be able to write the whole thing in your sleep. Utterly entertaining and undemanding it's a pure popcorn film. Its not high art but very well done. Its not anything I would have reviewed- or if I did it would have been cued several months from now.